NextWaveDV – 4K on the Sony FS700 will cost you an extra $9,000? 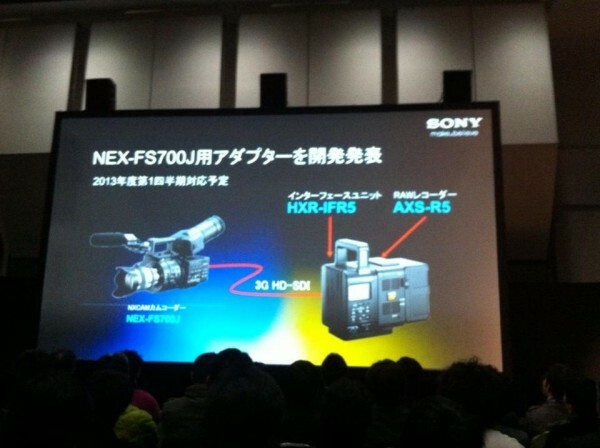 Sony announced their F5 and F55 along with the AXS-R5 4K recorder just a few weeks ago. The R5 pricing was kept under wraps but it looks like the cat may be out of the bag. One blog post puts the price of the A5 recorder around $6,000 (source). Another Tweeted picture shows the R5 and HXR-IR5 module together at 700,000 yen which breaks down to just under $9,000 (source). It has already been revealed that the HXR-IR5 module will be required for the FS700 to output 4K to the R5 recorder. The IR5 module has been announced at a price of $2,000 (source) which would make the A5 recorder come in at around $7,000 in the difference. Sony is expected to announce firm pricing by the end of November but FS700 shooters shouldn’t expect to see 4K available for their cameras until late spring or early summer 2013. Thanks to @noruweijin for the Tweet. Canon 5D MkII used in the filming of "Captian America: The First Avenger"